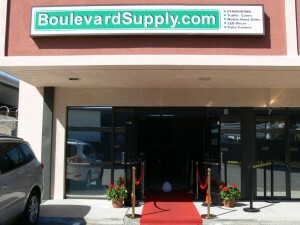 Established in March, 2014, Boulevard Supply is a Las Vegas, Nevada based tier 1 emerging small business. We provide local Las Vegas hotels, casinos, restaurants, schools, airports, construction companies, municipalities, valet parking services, parking management companies and nightclubs with a variety of crowd control and traffic control equipment. Since our inception, we have expanded with nationwide delivery, providing quality products and equipment along with friendly dependable service to even more industries and have also started rentals of traffic control cones and delineators in the Las Vegas metro area. Our goal is turning first time customers into dedicated repeat customers that would not hesitate to recommend Boulevard Supply to their friends. Please visit our Las Vegas location for a sample of what crowd control and traffic control equipment we have to offer. We are two minutes from the Las Vegas Strip.